Click on the option that best describes what you want and start shopping for the perfect design. I have a drop ceiling 2ft x 2ft (square) and I want to re-skin it with your faux tin tiles. I have a drop ceiling 2ft x 4ft (rectangular) and would love to cover it up with your beautiful tiles. I have a drop ceiling and would love to replace it completely. Note: Are you looking to replace your drop ceiling entirely? Check out our drop-ceiling tiles. We offer step-by-step instructions and videos to make replacing drop-ceiling tiles a manageable and easy process. You can also shop for materials right on our website. Would you like to add more character and charm to your existing ceiling? Chances are you have been playing around with the idea for some time, but have not managed to roll up your sleeves and get to work. Maybe you have not found a cheap alternative or maybe you just do not know where to start! In this video you will see the BEFORE and AFTER effect of using affordable PVC Ceiling Tiles over existing Armstrong Ceiling Tiles. Contact Cement has a lot of fumes, so it is important that you work in an area that is fully aerated. You can mount a working area outside of the building you plan to install the PVC ceiling tiles. You should set up an area for the existing tiles and another for the PVC ceiling tiles. Use the spray paint to paint the grits. The color you choose should match the color of the PVC ceiling tiles you intend to install. In the video a copper paint was used to match the copper PVC ceiling tiles. Get all the materials and tools you plan to use in one place. Arrange everything in the room to facilitate moving around. Locate the midpoint of the Armstrong tiles by using the measuring tape to measure the length and width of each side. The midpoint is the length and width divided by two. Step 1: Once you are finished spray painting the grit, then it is time to remove the Armstrong ceiling tiles. It is best to remove them one by one instead of all at once. This initial step can guarantee a smooth application; future visitors will be convinced that you know how to decorate a ceiling like a professional. Step 2: Place the Armstrong ceiling tile that you removed on the area you prepared outside and paint it with Contact Cement. You may use a roller to apply the Contact Cement if you prefer. This alternative is faster since you will be covering a larger surface area with the roller. Step 3: Apply Contact Cement to the PVC ceiling tiles. You should apply the product on the flat surface and not on the raised embossed area. Take care to apply to the edges as well. When this is done, then wait approximately 15 minutes to dry. Step 4: When the 15 minutes have elapsed, then you can put the PVC ceiling tiles on the Armstrong ceiling tiles. Press firmly against the PVC ceiling tile to ensure that all the areas you applied the contact concrete are touching the Armstrong ceiling tile for proper installation. Step 5: Once you have a tight fit, then use a sharp blade to cut away the excess of the PVC ceiling tiles. Step 6: Install the tiles in the area you originally removed the Armstrong ceiling tiles. Step 7: Repeat steps 2 to 6 until you have installed replaced the Armstrong ceiling tiles with PVC ceiling tiles. The amount of time you take will depend on the area of your ceiling. Step 8: Reinstall fixtures after the tiles are all in place. Tip 1: The amount of PVC ceiling tiles that you decide to install will depend on the area you intend to cover. You can either look at existing blue prints to determine the area of the ceiling or you can measure it yourself. When you have the total area, then divide this by the area of one PVC ceiling tile to determine how many tiles you will need. Tip 2: PVC ceiling tiles are perfect for any setting, so whether you have a business or want to have a new touch to your home, both are excellent areas. The versatility of the material makes physically manifesting ideas for ceiling tiles simple. Quick Installation time: You can transform the look of your existing ceiling in a day (this will depend on how big it is; large areas will require more time). This advantage makes it easy to get back into any routine without experiencing significant losses or inconveniences. When home owners consider how to decorate a ceiling, this quick process often appears as a frontrunner and for good reason. 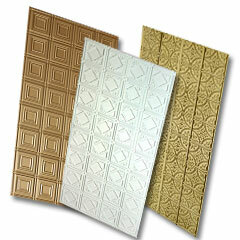 Affordable: PVC ceiling tiles are cheaper to use than other alternatives. They are also long-lasting, which means you will not have to spend excessively to maintain them. Consider replacing drop-ceiling tiles when refinishing or other minor fixes will not suffice. Professional Look: The PVC ceiling tiles you install will give your office a professional look that will add more value to your business. What is Your Ceiling Panel Size? 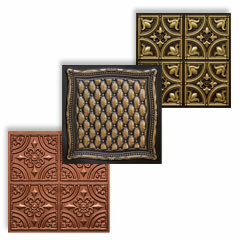 Even if your panels are 2ft x 4ft, you can use our 2ft x 2ft tiles to re-skin them, just use 2 for 1 of yours. Last note: If you are looking to replace your drop ceiling, you may also consider our drop-ceiling tiles to avoid the process of gluing. Contact us online for beautiful and unique drop-ceiling tile ideas that can make your home truly your own.